Let’s give the letter q a hand. 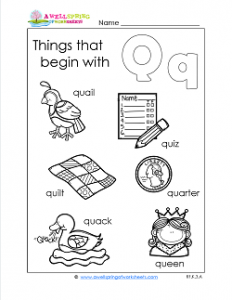 She’s quite hand to have around, especially if you want to say things that start with q, like the words on this worksheet for example. Words like queen, or quilt, or quail, or quarter, or quiz. Or maybe you just want to make a noise like “quack”. The letter q and it’s sound come in handy for that, too. Please feel free to print out this worksheet, read the word to your kids, have them circle each q, and color the cute pictures.